Do you ever wonder how your gifts make a difference? Whether it is a financial or material gift, the gift of quality time, or the implementation of your talents and abilities, we all want to know that our gifts, (tangible or intangible) are actually intersecting with something that matters. Oftentimes, we are left to wondering and never knowing—and that’s how life is—but from time to time we are surprised by the opportunity to taste and see the fruits of our labor. Those times are sweet for the soul. As many of you who are sponsors already know, a child’s basic needs can be supplied for only $30 a month. Yet we often receive calls and e-mails from sponsors who have one question: “Is there anything extra I can do for my sponsored child?” Eventually, after many calls of this kind, we realized we needed to create a place where sponsors could give an extra gift towards a child’s specific program called the Special Projects Fund. This fund is specifically designed to cover any exceptional needs (beyond the essentials provided by sponsorship) that come up in a sponsored child’s program. By faith, many sponsors gave to this fund, resigned to the fact that they may never know the impact their gifts made. The Little Flower Children’s Home is the name of one of our many Child Sponsorship Programs in India. 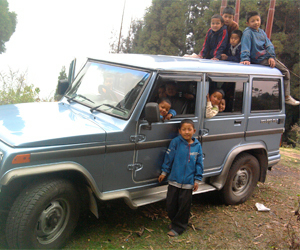 The vehicles used to travel and transport food and supplies for the children’s home desperately needed new tires. Without suitable replacements, safety on the road would become compromised, making the purchase of supplies for Little Flower very difficult. All of us know how expensive new tires can be—buying a whole new set is a costly investment. That’s where our sponsors came through. Through the Special Projects Fund for the Little Flower Children’s Home, we were able to fully equip the program’s vehicle with new tires, alleviating a significant burden from our in-country director and giving the entire program more stability. Four new tires was all it took.